A three day intensive workshop on movement and musicality for the stage. Devised by Anna Helena McLean & led by Anirudh Nair. Places are limited to only 15 participants so please be quick to book and avoid disappointment. Offers available for return participants interested in longer term training with the company and a residency in December 2016 at Auroville. ACT works together with Moon Fool and international collaborators to generate works that inspire social change and a community that promotes ethical and sustainable living. Ongoing collaboration with the following partners support our work specifically looking at Disability arts, Youth work, Climate Change and Environmental awareness, Politically oppressed communities and Personal Well being. Anirudh Nair is a theatre practitioner based in New Delhi. He completed his MA in Theatre Practice at the University of Exeter, UK, in 2008, under the guidance of Professor Phillip Zarrilli. 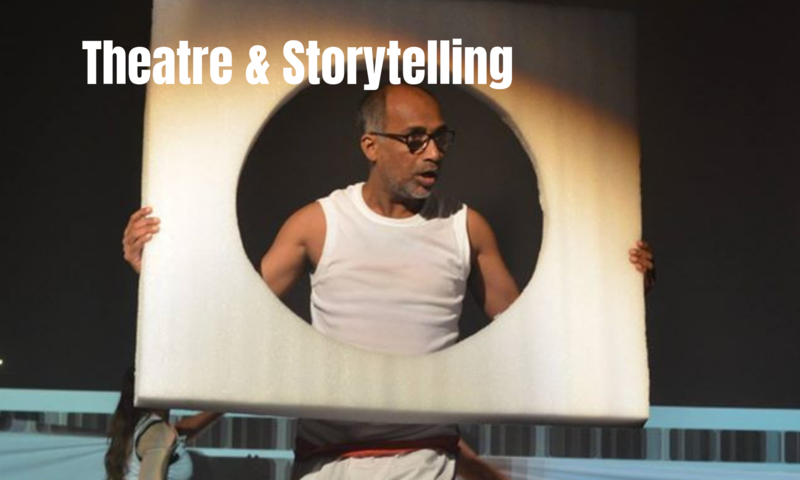 Anirudh has been a core member of Moon Fool since 2009, training and leading workshops in the Actor-Chorus-Text methodology evolved by the Director of the company Anna-Helena McLean. As an actor with the company he has been part of a work in progress performance of Romeo and Juliet which took place in Berlin in 2010 as well as the company’s latest production – STORM (an adaptation of Shakespeare’s The Tempest). STORM premiered in London in 2014 and toured Chicago in 2015. Over the course of his association with the company, he has also co-led multiple workshop residencies in the UK, USA as well as India. In 2005 he set up WIDE AISLE PRODUCTIONS (WAP) in New Delhi, a company committed to bringing professional rigours to independent theatre practice, with heavy emphasis on actor training. Wide Aisle’s work has been focused on classical texts, Shakespeare in particular. WAP’s most recent productions include The Winter’s Tale (co-directed by Anirudh) as well as Meet Will (a project designed to make Shakespeare accessible to school children through workshops and performances – currently touring schools with their new production of As You Like It). As an actor he is also a part of the Crystal Shakespeare Ensemble (London), a company focussed on Original Practice Shakespeare. He has been a part of their productions of Pericles (Stockholm, Sweden, 2015) and Henry V (London, UK, 2015). He is also a performer with the Tadpole Repertory (New Delhi). The repertory’s recent production Still and Still Moving received a nomination for Best Play at the Mahindra Excellence in Theatre Awards (META) 2015. Anirudh also received a nomination for Best Actor in a Lead Role. On graduating in Music & Drama from Royal Holloway, Anna-Helena became a principal member of leading experimental physical theatre company Gardzienice in Poland for 7 years. She is the Creative Founder & Artistic Director of Moon Fool, Actor – Chorus – Text (ACT) and ACT Youth she leads international music & theatre exchange work worldwide.She has been a guest director & trainer for BA & MA actors at the Royal Conservatoire of Scotland annually since 2004, as well as working in association with the NSD in Delhi, and drama schools and universities throughout the UK, Europe and beyond.